OPINION — Are you ready for front row seats to the beginning of the toughest professional cycling event in America, “Tour of Utah”? A few options have been created that will make more room for the many to view Stage 1 of the race which courses through Zion National Park and cut down on congestion in its gateway town of Springdale. This year, Southern Utahns have the privilege of having the Tour’s Stage 1 in their own backyard. Starting at Zion Canyon Village, the entry to Zion National Park, the Tour proceeds as a rolling start, cruising up the switchbacks of Zion National Park, through the tunnel and finishing in Cedar City. Riders pedal 84 miles this first day alone, gaining almost 7,000 feet in elevation. Stage 1: Zion Canyon Village to Cedar City | 84 miles | 6,679 feet elevation gain | Aug. 1. Stage 2: Escalante to Torrey | 99 miles | 9,435 feet elevation gain | Aug. 2. Stage 3: Richfield to Payson | 119 miles | 6, 337 feet elevation gain | Aug. 3. Stage 4: IM Flash – Lehi to Kearns | 96 miles | 4,504 feet elevation gain | Aug. 4. Stage 5: Antelope Island State Park to Bountiful | 114 miles | 6,948 feet elevation gain | Aug. 5. Stage 6: Snowbasin Resort to Snowbird Resort | 114 miles | 11,165 feet elevation gain | Aug. 6. Stage 7: Park City | 78 miles | 7, 883 feet elevation gain | Aug. 7. For more information on the Tour as a whole, visit Tour of Utah online. One of the coolest facts about Stage 1 is its start near Zion National Park. This is the first time that a national park has issued a permit for an event to use part of a park thusly, and it’s the first time a park will have limited road closures for riders to pass by. Allowing the Tour to go through Zion is a celebration of Utah, Zion National Park, the National Parks Centennial and of cycling. Actually, having the Tour in Southern Utah was controversial when first suggested. Springdale revolted against the influx of more cars and more congestion (otherwise known as “cargestion”). And rightly so. Memorial Day weekend, for example was ridiculously packed — some families tried to ride bikes through the canyon that Sunday but there were too many cars in Springdale. Total bummer. As the gateway to Zion National Park — which drew over 3.6 million people in 2015— Springdale bears the brunt of cargestion. In fact, cargestion was the primary reason the park started the shuttle system several years ago; it has been a great way of handling traffic within the park. But there are still too many cars in Springdale, and the city was correctly worried about the cargestion brought about by such an awesome event as the Tour of Utah. Thankfully, Nathan Wells, manager of Zion Canyon Village, stepped in and said he would host the Tour on his property. And so others started getting involved, including Joey Dye of Red Rock Bicycle and Craig Shanklin, president of the Southern Utah Bicycle Alliance, among other local and passionate advocates of cycling. They became the Local Organizing Committee, which has diligently worked for over a year to find a way to start this race in or near Springdale and Zion, while honoring Springdale Town’s concerns. So the Local Organizing Committee has done something really cool: They have made efforts to use the Tour to highlight the effect of cargestion on Springdale and its adjacent national park. Working with Utah Department of Transportation, the Utah Highway Patrol, Springdale Town, Zion National Park, Southern Utah Bicycle Alliance and many local businesses and individuals, the Tour is working to leave a legacy and be a long-term positive for Springdale. It wants to put in an infrastructure that will help Springdale and the park deal effectively with cargestion. One such measure is a paved bike path being built by UDOT. The path will connect Virgin to Springdale, allowing people to park a ways outside the park and cycle in. 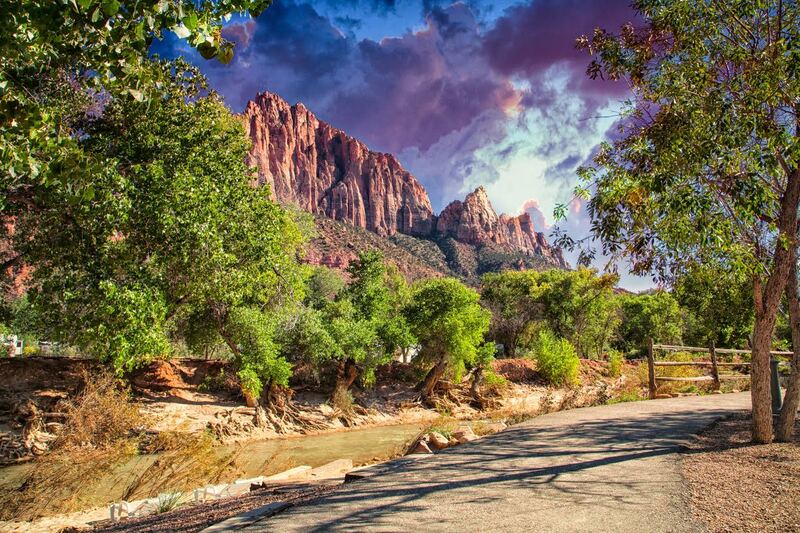 As many may know, cycling through Zion Canyon is a great way, if not the best way, to see it. So being able to cycle along the Virgin River towards Zion will be a fantastic way to approach Springdale and the canyon and cut down on cargestion in Springdale. First, they encourage people to come to the event by bicycle; start in Rockville (5 miles to the start) or Virgin (13 miles to the start). Southern Utah Bicycle Alliance reminds riders parking is restricted along state Route 9 in front of the residences in Rockville. 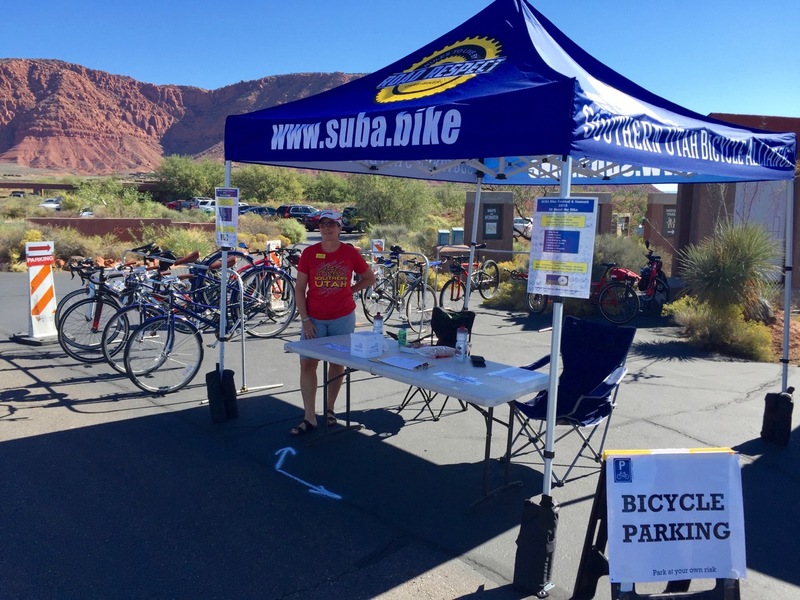 Use lights and high-visibility gear and plan to arrive at Zion Canyon Village around 7 a.m.
Second, once you get to Springdale on your bike, use Southern Utah Bicycle Alliance’s bike valet. Follow the “Bike Valet” signs to the race venue — safe and secure bike parking from 7 a.m. to noon. Third, take the bus. The organizing committee has chartered a bus from Washington County, which will pick up at various places throughout the county. At only $10 per person, it’s a total deal and you will be doing your part to reduce cargestion in Springdale. The deadline to get on the bus is July 31, with 50 percent of proceeds going to the Southern Utah Bicycle Alliance and 50 percent to the Zion National Park Foundation. Get a seat on the bus: Follow this link. This is a great opportunity to see the very beginning of an epic cycling event, the Tour of Utah, starting right in Southern Utah. With many people from the pro-cycling circuit as contenders, including TJ Eisenhart, a Utah resident who holds many local Strava KOMs (from King of the Mountain), making his first professional appearance at this race, spectators will get a chance to mingle with some of the best cyclists in the world. Some have even called the Tour of Utah America’s Tour de France – and yes, it’s starting right here. Whether by bicycle or by bus, get to Zion Canyon Village and send off the cyclists Aug. 1 at 7:55 a.m. See you there! Updated July 27: Reminder added that parking is restricted along SR-9 in front of the residences in Rockville. Summer Barry is mountain bike fanatic, infrequent roadie, wife, mom, salesperson at Red Rock Bicycle, stained-glass artist, designer and about a million other things with a million other interests. She has lived in St. George for the last 18 years, and really started loving it when she started mountain biking our great trails. As well as contributing Road Respect columns to St. George News, Summer writes for Red Rock Bicycle's weekly blog and is thankful her English degree, and several years teaching writing, are put to good use. The best way to watch this race is on TV news, online or YouTube. I can imagine families trying to find safe parking in Virgin or less likely, Rockville, only to ride bikes on narrow shoulders with 40 to 65 mph speed limits (people driving faster, I’m sure). After the dangerous ride in August heat, (those bike paths won’t be complete by the race… UDOT hasn’t started them yet) the spectators can stand just outside the National Park gate to watch a bunch of fresh, fast racers whizz by in a few minutes. Wow. What a thrill. Stay home, and enjoy the race some other way. Given that Springdale and other communities didn’t seem to want this event and it was basically forced on them, I don’t think Mike’s being whiney at all. Seems that the cyclists who perhaps went whining to state and national leaders to do their bidding for them might be the real whiners.